After four days of hard hunting in desert-like conditions, Tom and I both got our bucks on the last evening of our hunt just before we were to pack up and go home. You might find the story of how I recycle my arrows, interesting. I had only two arrows in my quiver. I stalked within 20 yards of the buck while he was laying down. When I let the arrow fly he never knew I was there. Somehow with the exhausting stalk and a little buck fever, I shot just over his back. 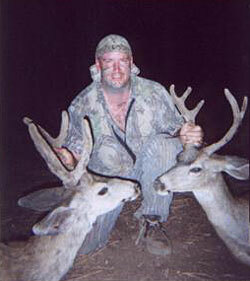 Rob Dellinger, above, and Tom Chaney, right, show off the bucks they took during the 2000 California X Zone archery season. He ran about 30 yards from me and stopped broadside. I pulled the last arrow from my quiver and took the shot. Exhaustion must have taken over again (couldn't have been me, #/$&*#). I missed again, just over his back. I thought it was over. No arrows left!!! He ran up the hill to where a doe was standing 40 yards above me and was looking back at me. I am sure he was saying to himself, that hunter can't shoot. I looked around and saw my first arrow sticking in some soft dirt where I missed him the first time. I ran over and got the arrow. I checked it out and the blades looked fine. He was still standing there watching me. I nocked the arrow and took a deep breath and told myself, third time is a charm. I let the arrow go and it entered just behind the rib cage and traveled through the heart. He ran 40 yards and dropped like a rock. 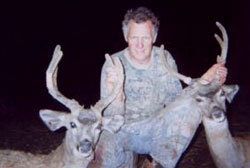 It was Tuesday, August 22, 2000 at 6:30 p.m.
My hunting buddy Tom had taken his buck just one hour earlier. I was shooting a Mathews MQ-1 bow with Savora 125 broadheads. Tom shot his buck at 30 yards also with a Mathews MQ-1 with Muzzy 125 broadheads.